Winfrey’s generous impact to the world began in 1998 when she created Oprah’s Angel Network that supported charitable projects and provided grants to nonprofit organizations around the world. Oprah's Angel Network raised more than $80,000,000 before ending in 2010. In 2000, during a visit to Nelson Mandela, Ms. Winfrey pledged to build a school for girls in South Africa to serve girls who showed outstanding promise despite their impoverished backgrounds and social circumstances. Oprah Winfrey is a global media leader, philanthropist, producer and actress. 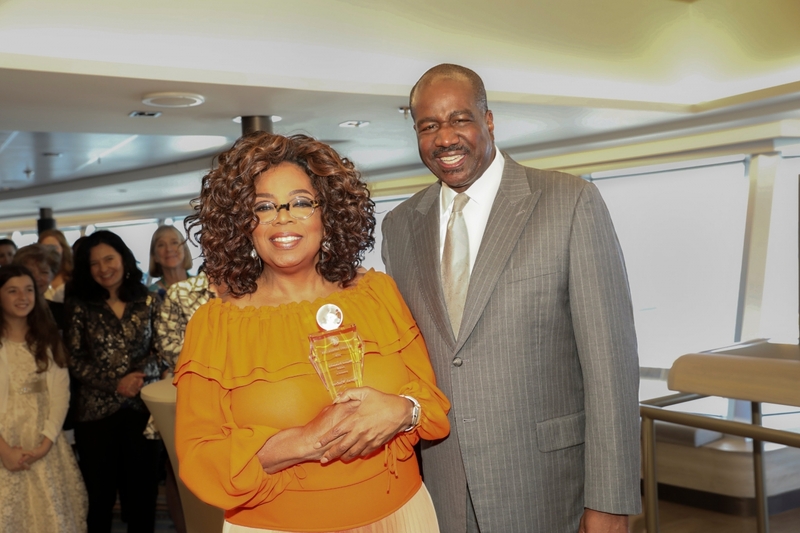 For 25 years Oprah was host of the award-winning talk show “The Oprah Winfrey Show.” As chairman and CEO, she guides her cable network, OWN: Oprah Winfrey Network; is founder of O, The Oprah Magazine; and oversees Harpo Films. Oprah starred in HBO Films' “The Immortal Life of Henrietta Lacks” and portrayed Mrs. Which in Disney's “A Wrinkle in Time” film adaptation from director Ava DuVernay. Winfrey's cookbook, “Food, Health and Happiness: 115 On-Point Recipes for Great Meals and a Better Life,” debuted at number one on The New York Times Best Seller list, as did her most recent book “The Wisdom of Sundays,” featuring today's most admired thought leaders who have appeared on OWN's Emmy Award-winning talk series “Super Soul Sunday.” The podcast versions of these interviews, “Oprah’s SuperSoul Conversations,” are also available on Apple Podcasts and where podcasts are available. Born from a pledge by Oprah Winfrey to former South Africa president Nelson Mandela, Oprah Winfrey’s Leadership Academy for Girls is committed to providing a rigorous yet supportive education system that encourages high standards of academic achievement, service leadership and provides cultural enrichment for girls who show outstanding promise, despite their disadvantaged backgrounds. As of 2018 more than 430 OWLAG graduates have attended colleges and universities around the world, with 17 of those girls graduating from U.S. colleges and universities. Editor’s note: Photos are available at https://www.cruiseimagelibrary.com/c/b6mbiew6. Holland America Line’s fleet of 15 ships offers more than 500 cruises to more than 400 ports in 98 countries, territories or dependencies around the world. From shorter getaways to 128-day itineraries, the company’s cruises visit all seven continents, with highlights including Antarctica explorations, South America circumnavigations, EXC In-Depth Voyages, Cuba cruises and exotic Australia & New Zealand and Asia voyages; two annual Grand Voyages; and popular sailings to the Caribbean, Alaska, Mexico, Canada & New England, Europe and the Panama Canal. The line welcomed Nieuw Statendam in December 2018. A third Pinnacle-class ship will be delivered in 2021.